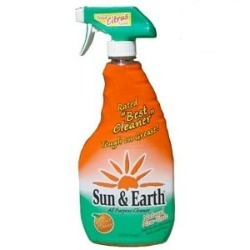 Rhonda has shared her Sun and Earth all purpose cleaner review. I first bought Sun & Earth's all purpose spray cleaner to use in my bathroom, and it worked very well on the bath tub, sink and toilet. I even emptied out my medicine cabinet and cleaned it with the spray cleaner. It is really convenient to use. The spray container is well engineered. This is important to me since I have some arthritis in my hands, and having to press down hard on some of the sprays I've tried has been difficult for me. I really began to appreciate its cleaning power when I read on the label that I could use it to clean tile floors. This was a surprise to me, and a real plus. I had not been able to find a floor cleaner that was non-toxic and environmentally friendly. I have two cats, and hesitated to use something on my kitchen floor that would harm them. I mixed the 1 to 10 proportions the label suggested and it made my floor cleaner than I have ever been able to get it. Somehow other cleaners would leave some kind of film on the floor, no matter how much I rinsed. It was so lovely that I decided to not use any wax on the floor. Now, I just mop it every couple of days...it's easy, non-toxic, and--yes, safe for Whiskers and Sunny. Thanks Rhonda for your Sun and Earth all purpose cleaner review. I would love to hear from others too, who have used this product, sharing your review. You can share your natural all purpose household cleaner review here, or read other reviews of other brands which have already been submitted. In addition, I would love to get more reviews about this eco-friendly brand. You can share your reviews of the Sun & Earth brand, or any other green cleaning supplies, by sharing your Earth friendly cleaning products review here. Earth Friendly Cleaning Products Reviews - Which Brands Work Best?